Have you ever wondered what happens in those years after the Superheroes have saved the planet? Would they continue to fight crime or would it all turn into a big PR exercise? While many would see them as noble warriors who are elevated far above the common man what would happen if they themselves fall under this illusion, could they mistakenly believe they are infallible?. Worshipped and adored by millions, the Seven Wonders protect the Metropolis of San Ventura but years of conflict against their arch nemesis "The Cowl" have taken their toll and it could be said that these heroes may have even lost their way. When ordinary guy-on-the-street Tony Prosdocimi develops super-powers of his own he jumps at the chance to take down "The Cowl" and do what the Seven Wonders have never been able to do; however he soon finds that the Seven Wonders are nowhere near as grateful as he thought they'd be. Adam Christopher first burst onto the literary scene with the noir-tinged superhero novel Empire State and while Seven Wonders isn't a sequel to that fine novel, it is a distinguished novel full of superheroes and supervillians that shares some of the same characteristics. This super vision owes just as much to the Watchmen style than it does DC or Marvel, although there is a distinct shiny "larger than life" theme this is combined with a realism that see's bystanders die and more gore than many sanitised tales would depict. This extends to the superheroes themselves, each of which are wonderfully flawed in their own little way, it's intelligent, stylish and perfectly suited for an adult audience. The plot itself is inventive and twisting, written in a literary arresting style that is about as close you could ever get to a graphic novel without the graphics. You could quite easily imagine this book as a film and the feeling of being sucked into a living, breathing superhero story is quite incredible. I loved the way the author describes the changes that Tony goes through as he discovers his powers and it's a great slant on how someone might react in this situation. There is a bit of a shock with this character half way through the novel and it really does mix things up for a while, leaving the reader wondering what direction the story will take and handled very effectively. The authors style is more pronounced, with a more confident voice and even greater quality to the prose; it's clear that this talented author is improving with each new tale and will be going to great places in the future. The pace is a little uneven in places and does slow down at times however this is fairly minimal and is only a very slight niggle in an otherwise excellent novel. 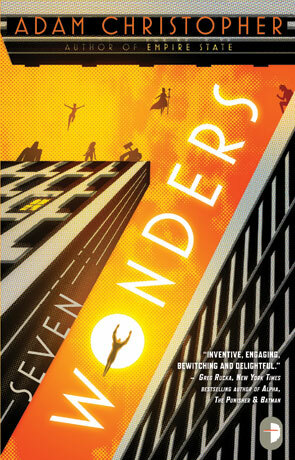 Seven Wonders is the coolest kid on the superhero block, it's got bags of style, an incredibly rich atmosphere and a cracking story that keeps the reader on the edge of their seat for most of the journey. Written on 24th August 2012 by Ant.